Pinterest's fraud triangle is a classic. 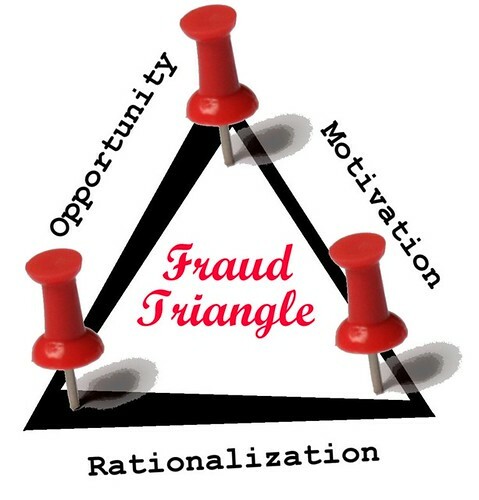 The "fraud triangle" is comprised of motivation, opportunity, and rationalization. Satisfying a compulsion/addiction to "collect things" and "own" a vast digital hoard. Fantasy ownership, like "Second Life." Pinterest supplies the social media context that makes up the "incentives." The belief that there is no legal consequence. "Artists will create anyway, so financial incentives are moot." Authors, artists and musicians are going to have to adapt to the new reality that I've taken it upon myself to distribute their work in their stead. I'm not using it commercially. Art is meant to be shared. By me. To gain the esteem of strangers on the internet. Don't publish it if you care about copyright. I'm giving you invaluable publicity. I wouldn't license your stupid photograph anyway. No one should make a living from artistic pursuits. Does Pinterest exploit its users to get between content creators and their incomes?